When we first hear people discuss their lower backs we often think of the word “pain”, rather than “astounding strength” or “superb development”. The notion of training the lower back to elicit specific muscular development can often be neglected outside of formal strength and power sports. Regardless of your sport, nearly every athlete can benefit from strengthening the erectors (lower back muscles), glutes, and hamstrings, often the three working dynamically together, referred to as the posterior chain. For some lifters, squats and deadlifts may very well be all the “lower back” training they need, however others may find that their backs (and often glutes/hamstrings) have inadequate capacities to develop force. It is important to note that, some lifters may struggle more with mobility and flexibility of the hips, spine (lumbar and thoracic extension), and even knees, which may result in compensated movement patterning. It is important to note that athletes who may have injury to the spine, discs, or movement imbalances should seek medical attention and rehabilitation prior to attempting these strengthening exercises. 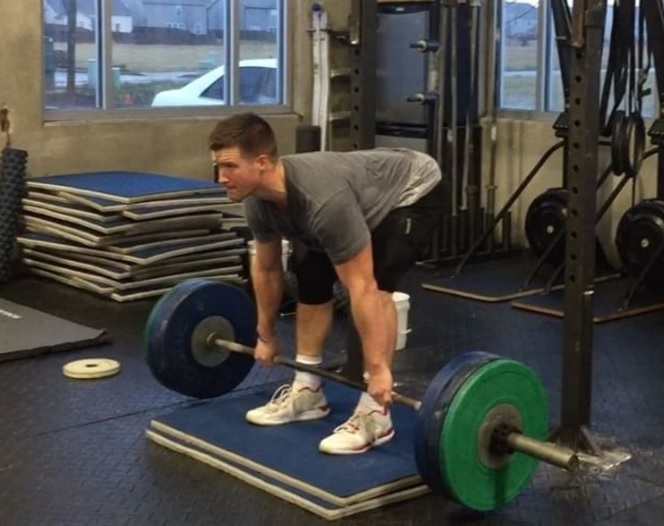 In a previous article we discussed the history of the Romanian Deadlift and how weightlifters, powerlifters, and functional fitness athletes can benefit from performing this exercise. Increasing posterior chain strength will assist and further develop the lower back musculature, resulting in increased performance and injury resilience. To perform, I recommend using a load that is 70-100% of your clean (or 50-60% of your deadlift) for 3-4 sets of 6-10 controlled repetitions. This exercise places a greater stress upon the back and lower back, and can be done to improve strength and stability across the full range of motion while hinging at the hip, such as in the clean, deadlift, low bar squat, and pulling movements. To perform, choose a load that allows you to control the load eccentrically, stretching the hamstring. I tend to keep the loads lighter (lighter than the Romanian Deadlift loads) to allow for better hinging and movement. These bodyweight classics can do wonders for the posterior chain and lower back. Increasing the volume, loading, and or pausing at the peak of the movement can create concentric, isometric, and eccentric strength of the erectors, which are vital for heavy pulling, squatting, and ballistic movements. Challenge myself with this one, performing 3-4 sets of 8-12 repetitions with a moderate to heavy load. While this exercise highlights the glutes, insufficient glute strength can result in lower back pain, which is often mistaken for weak erectors. Hamstrings and glute muscles are the prime movers for squatting and pulling, which means the stronger they become the healthier the lower back will too. While performing these glute extensions, be conscious of stabilizing the spine, only moving at the hips to minimize spinal extension and/or flexion. Loading can be heavier with this movement, as long as the spine is stable. Typically, lower back exercise can be included in assistance section of the training session, which is often after the main power and strength blocks. Moderate loading and volume can be performed while keeping a high emphasis on sound movement patterning and a neutral back. Developing the posterior chain, and specifically the erectors can increase force production, spinal stability, and decrease risk of injury (provided movement patterning and mobility are sufficient) in training and sport.